Decades before Christina Aguilera sang about being a “Genie in a Bottle,” Barbara Eden was charming TV audiences on a weekly basis in the guise of a similar, mystical alter ego on the beloved sitcom I Dream of Jeannie. The NBC series, which premiered in the fall of 1965 as the network’s answer to ABC’s hit Bewitched, starred Eden as the stunning, bottle-dwelling genie discovered on a deserted island by stranded astronaut Tony Nelson (a pre-Dallas Larry Hagman). One look at Eden’s scantily-clad, harem-costumed enchantress, and Captain (later, Major) Nelson was a goner, as Jeannie followed the NASA pilot back to Cocoa Beach, Florida for five seasons of madcap fun. She may have referred to him as “Master” (even after the characters got married in the series’ final season, which, let’s face it, was just plain weird), but anyone who’s seen an episode of I Dream of Jeannie knows that it was Eden’s all-powerful genie who was really in charge of the Nelson household. 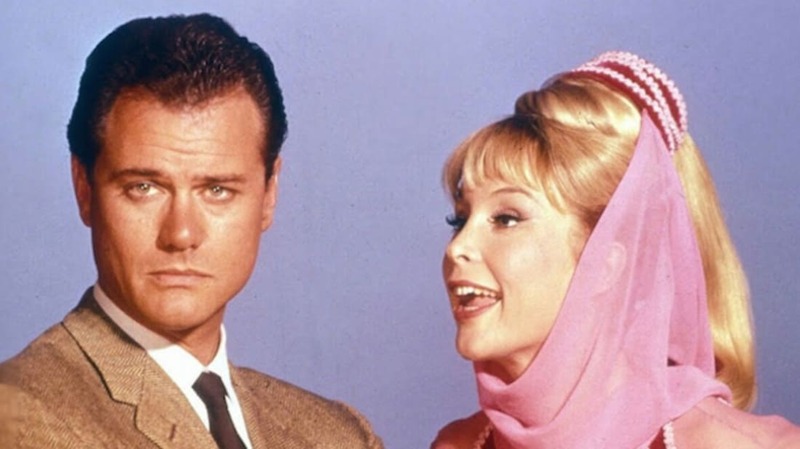 In honor of the sitcom’s 50th anniversary, read on for 11 of the most magical facts about I Dream of Jeannie. 1. BARBARA EDEN DIDN’T LIKE THAT JEANNIE AND TONY NELSON GOT MARRIED. The palpable sexual tension between Hagman’s astronaut character and the mischievous genie who lived under the same roof for the first four seasons of the series was what kept the series exciting—the objectification of Eden’s character notwithstanding. Here was a midriff-baring beauty, willing and able to fulfill her master’s every wish and command, and he still managed to keep her out of his bedroom for most of Jeannie’s run. By 1969, the sexual revolution was well under way, and it was time for Tony and Jeannie to get together. Except, as we all know, that kind of creative decision usually sounds the death knell for a TV show, and I Dream of Jeannie was no different. The characters tied the knot during the 1969-1970 season, which ended up being the series’ last. 2. THE FAMILIAR-SOUNDING JEANNIE THEME SONG DIDN’T EXIST UNTIL THE SECOND SEASON. You know the tune: Matthew Broderick did an unforgettable 12-second dance to it in Ferris Bueller’s Day Off. But the bouncy riff that will always be synonymous with I Dream of Jeannie didn’t first appear until the series’ second season, when a new, in-color animated opening sequence was introduced. The first season, which was filmed in black and white, tried a couple of different openers: First there was the expository one that brought the audience up to speed on how Jeannie and Tony met; eventually, the exposition was dropped for this jazzy, albeit abbreviated, animated sequence. 3. BARBARA EDEN WAS PREGNANT FOR THE FIRST SEVERAL EPISODES OF THE SERIES. Jeannie’s skimpy pink-and-red harem costume was an instant iconic look for the show, but aside from the fall 1965 pilot, titled “The Lady in the Bottle,” Eden was significantly covered up for the first 10 episodes of the series. It wasn’t because of any censorship issues; the actress was expecting a baby. Eden confirmed her pregnancy on the very day that I Dream of Jeannie was picked up. Instead of replacing her, the producers decided to hide her growing belly via a multitude of techniques, including adding several extra veils to her Jeannie costume. “I looked like a walking tent,” joked Eden in a 2001 Lifetime Intimate Portrait documentary. 4. LARRY HAGMAN FOUND OUT I DREAM OF JEANNIE WAS CANCELLED FROM A STUDIO GUARD. 5. EDEN AND HAGMAN REUNITED FOR A STORY ARC ON DALLAS. 6. NOT ONLY DID BARBARA EDEN PLAY A GENIE, BUT SHE WAS AN ON-SET LION WHISPERER TOO. 7. PHIL SPECTOR MADE A CAMEO IN THE THIRD SEASON. 8. I DREAM OF JEANNIE HAD A FUN LITTLE CONNECTION WITH FELLOW NBC SITCOM THE MONKEES. The following year, in the Jeannie episode “Jeannie, the Hip Hippie” (see above), Jeannie puts together a rock band featuring Tommy Boyce and Bobby Hart, who penned some of The Monkees’ most famous songs. At one point, an instrumental version of one of the duo’s biggest hits for the band, “Last Train to Clarksville,” can be heard. Plus, Hart is holding a copy of The Monkees’ first album in one scene. 9. PARIS HILTON PLAYED BARBARA EDEN IN AN EPISODE OF AMERICAN DREAMS. In one of the final episodes of NBC’s 1960s nostalgia-fest American Dreams (2002-2005), teenage protagonist Meg Pryor (Brittany Snow) and her best friend Roxanne Bojarski (Vanessa Lengies), take a trip to Los Angeles in early summer 1966. While exploring a studio lot (they were dancers on American Bandstand), they stumble onto the I Dream of Jeannie set and meet Barbara Eden. In keeping with the series’ pattern of having popular stars of the day (read: the mid-aughts) portray popular stars of the ‘60s, Eden was played by then-It girl Paris Hilton. Hilton’s Eden, who just happens to be walking around in her Jeannie costume (American Dreams was never one for authenticity), makes the girls’ day by recognizing Meg from Bandstand. 10. LARRY HAGMAN’S BEHAVIOR ON THE JEANNIE SET IS THE STUFF OF LEGEND. It wasn’t easy for an ambitious actor like Hagman to play second fiddle to someone else, even if that someone else was Eden. Although Eden fills her memoir, Jeannie Out of the Bottle, with plenty of accolades for her co-star, she also shares many stark truths about his on-set behavior. Frustrated with what he saw as the show’s weak and overused scripts, Hagman self-medicated with alcohol and drugs. “He started every day at the studio drinking vast quantities of champagne,” wrote Eden, “and in between scenes, he sequestered himself in his dressing room, smoking pot and downing yet more champagne, all in the interests of maintaining a calm serenity.” Eden also wrote that he once even went so far as to urinate all over the Jeannie set. For the record, Eden did not witness this act, but was familiar enough with the actor’s moods that she knew when to make herself scarce. 11. EVEN AT AGE 78, BARBARA EDEN ROCKED THAT JEANNIE COSTUME. In 2013, the woman who will forever be known as Jeannie donned her signature red-and-pink harem pants and matching bolero jacket for an appearance at the Life Ball charity gala in Vienna, Austria. As part of the AIDS benefit’s festivities, Eden channeled her TV alter ego by folding her arms and blinking her eyes, bringing forth Bill Clinton. He may not have been Major Tony Nelson, but the former president did in a pinch.